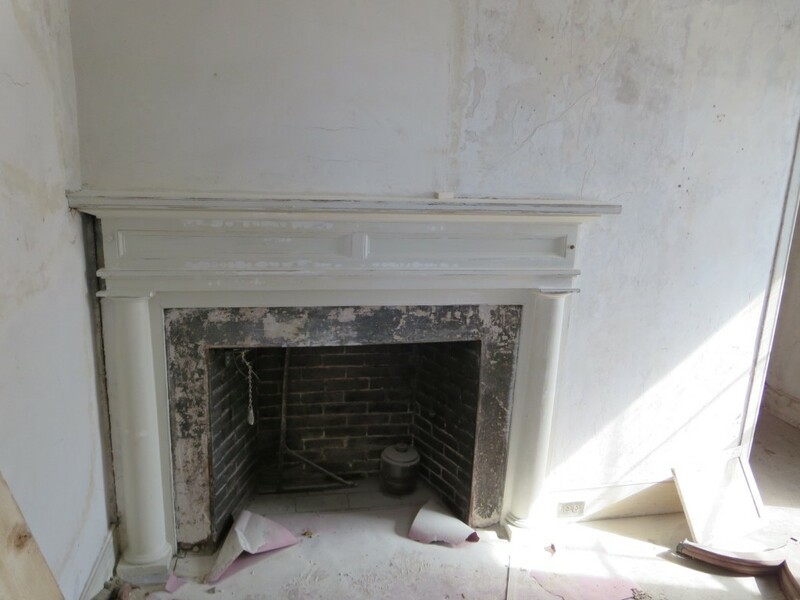 In this week’s Friday Find learn more about the restoration project at 55 Union Street. 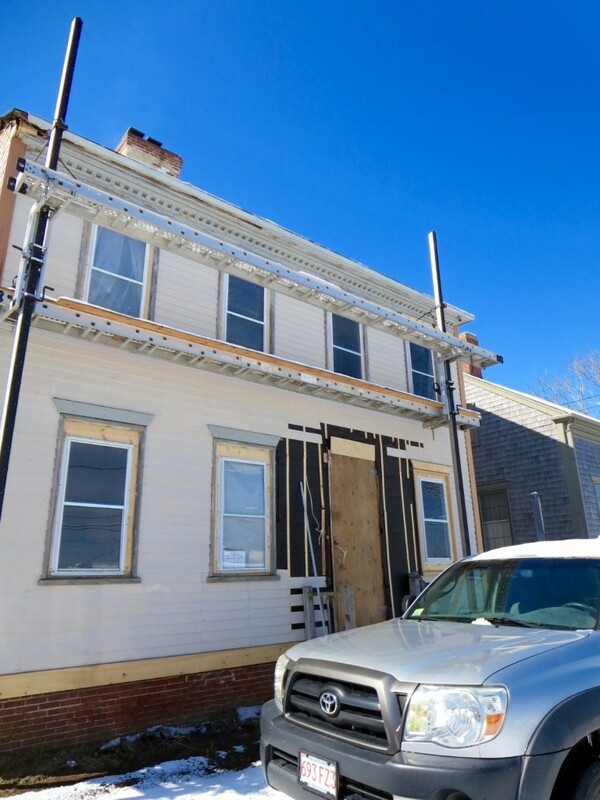 A lot of progress has been made at 55 Union Street since our first report (click here) posted in November. Do you remember this photo of the chimney? As we approached the house this week, smoke was pouring out of the chimney which lead us to believe inside things were going to be quite different. The photos below show the progress made over three months! 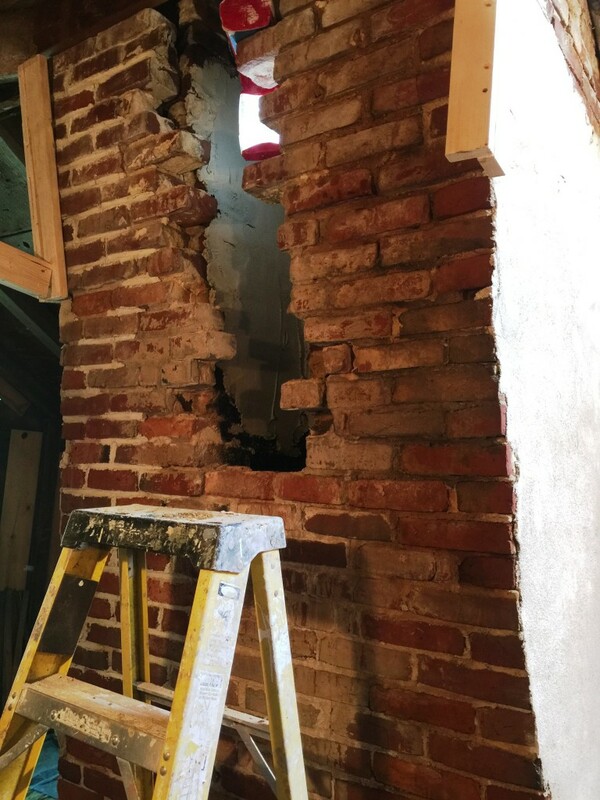 In November, Pen Austin (55 Union Street co-owner and master craftsman) broke through the chimney wall to gain access to the flue in order to repair the lime mortar. 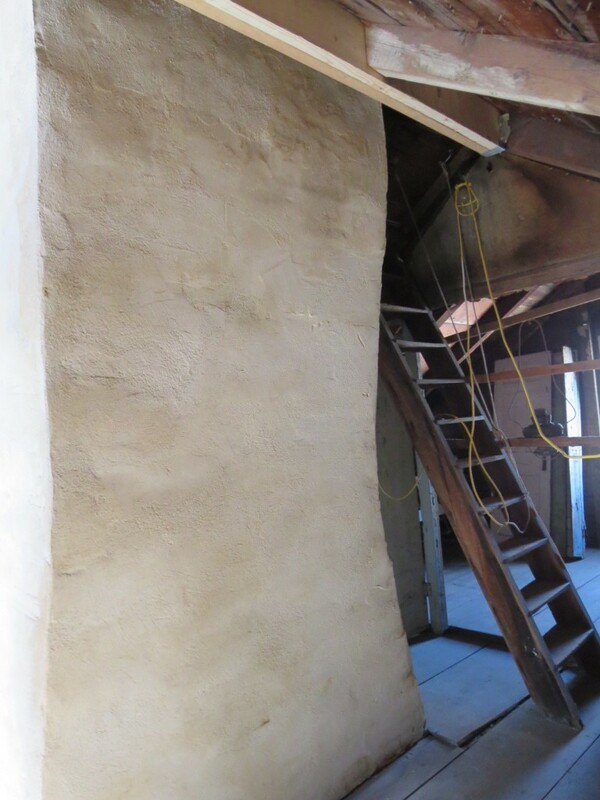 The repair work is now complete and the chimney’s original bricks are covered by plaster (see photo below). The mantels, covered with many layers of paint, have been carefully stripped by hand and primed—ready to receive a final painting. During our visit, the project was in full swing with multiple projects going on in different rooms. 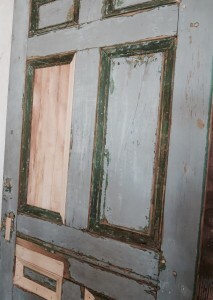 A preservation carpenter, a graduate of the North Bennet Street School’s Preservation Carpentry Program, was restoring doors including repairing damage and correcting previous improper repairs to the original front door which will soon be reinstalled. 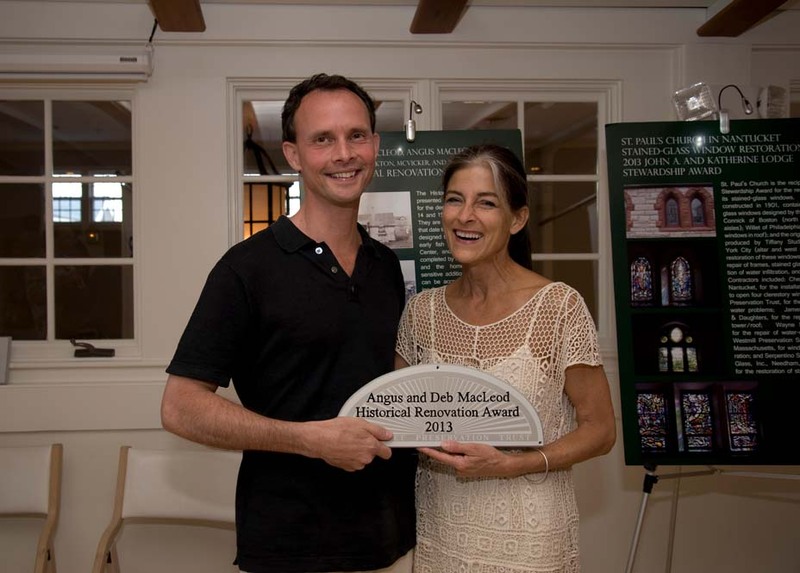 Artifacts, including antique bottles, pottery shards, and newspaper articles, discovered around the house and in the cistern, were gathered in one room of the house (see video below). Among the significant finds was the discovery that the rear ell was built at the same time as the front core of the structure. Rear ells are often thought to be later additions, but that is not always the case. At 55 Union, the age was discovered by looking at the consistent and continuous sheathing boards, timbers and sills found in both sections. Although in poor condition much of the ell’s structure will be reused. For example, the lath has been salvaged and will be reused where new plaster walls are needed. The work is ongoing and discoveries are being made every day. A majority of the original windows were saved and are currently undergoing repair off site. 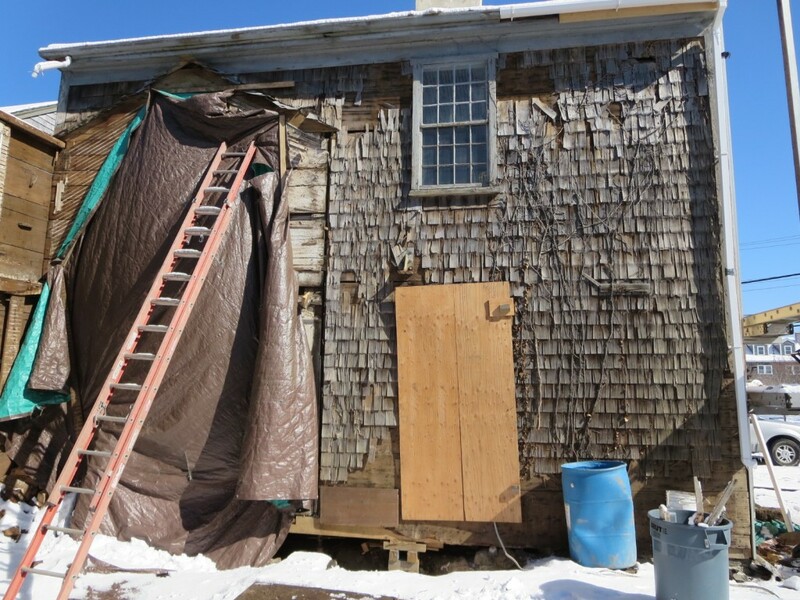 The front elevation of the house is being restored to its original state with clapboards rather than shingles as evident in early photographs. The elaborate door frame has been lovingly restored and will be installed soon.The project is making fast progress so stay tuned for future updates. Friday Find: Madaket Millie Memorabilia! This week we found some amazing Madaket Millie memorabilia! To be technically correct, we were generously gifted items by the current property owners of 343/345 Madaket Road, which is home to infamous Madaket Millie’s shack. Mildred Carpenter Jewitt, who later became known as Madaket Millie was born in 1907 and passed away on the island in 1990. She left behind quite a legacy and was an island celebrity. 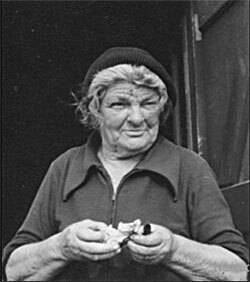 Many may remember or have heard the stories of island curmudgeon, Madaket Millie! Living her entire life on the island’s west end with very few trips off-island Millie served as Madaket Harbor’s watch guard. Ironically she disliked water and could not swim but was eventually was given the honorary rank of chief warrant officer. She helped rescued ships and it has been noted killed a 300 lb shark, with a pitchfork! The term “crusty” has been used to describe her; however those who truly knew the island celebrity knew Millie was full of love. 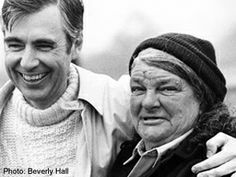 She cared for her neighbors (one being Mr. Rogers) and was a passionate animal lover. Millie not only guarded the seas but was known to be a master at shucking scallops and briefly an ice-cream shop owner. 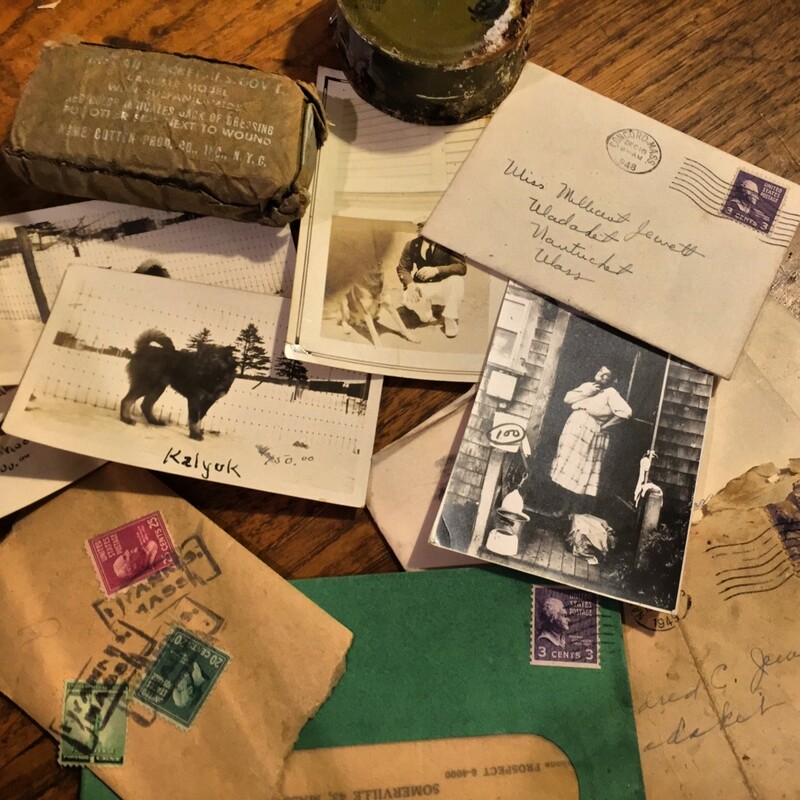 The memorabilia includes items such as her blood donor card, personal love letters, Christmas cards, personal photographs, newspaper clippings and more! A raffle package containing items will be raffled off at the August Fete. This year’s event will feature Nantucket’s historic village, Madaket. The tent site will be located on the property, where Madaket Millie’s shack still stands and along with her scallop shanty will be available to tour along with historic Madaket cottages. Are you interested in owning a piece of Nantucket’s history and experiencing what life may have been like for Madaket Millie?! Be sure to purchase tickets to the 2015 August Fete (for more information click here). The design of the house at 71 Baxter Road contrasts vividly with the earlier Victorian and Shingle Style houses along the North Bluff of Siasconset. The unornamented one-story L-shaped house with the wide chimney was built for Judge Jesse B. Cunningham and his wife, Caroline, in the summer of 1939. 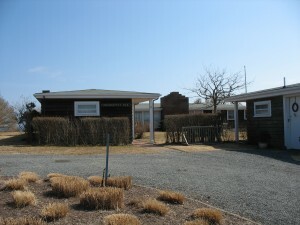 It is one of the first modern houses on the north bluff, with a distinctive design characteristic of the International Style of architecture so designated by Henry-Russell Hitchcock and Philip Johnson in an exhibition of modern architecture at the Museum of Modern Art in New York in 1931. A catalog of the show expounded on the basic tenets of a style that had evolved over the previous decade, among them an emphasis on the horizontal plane, an avoidance of superimposed decoration, and an appreciation of functionality, all characteristics suited to ‘Sconset’s architectural heritage. 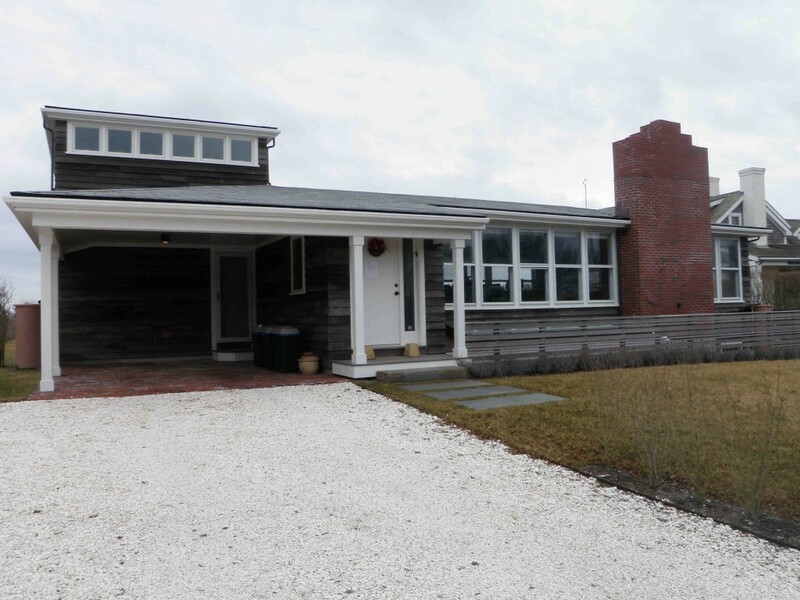 Unfortunately, we have no clues about the personal aesthetic of the Cunninghams—whether they were familiar with current trends in architecture from travels in Europe and the United States, what brought them to ‘Sconset, and what influenced their decision to build their summer cottage in a modern style. Since the house is so markedly different from others on the island , it is probable that it was designed by an architect the Cunninghams knew in Pennsylvania. One of the best known American architects working in the International Style in the 1930s and ‘40s was George Howe of Philadelphia; although there is no evidence that Howe designed the house, it is possible he or an associate created a sketch of the simple cottage for the Cunninghams. Other potential candidates whose work may have influenced the design of 71 Baxter are Frank Lloyd Wright, whose sister, Maginel Wright Enright Barney owned a Nantucket summer home for more than twenty-five years (she sold it in September 1939) and German architect Walter Gropius, founder of the Bauhaus School, and Marcel Breuer , both of whom came to the United States at this time to teach at Harvard. It is conceivable that an associate of one of these well-known architects working in New England in the late 1930s may have had a hand in the design. The property at 71 Baxter changed hands twice before it was purchased by long-term owners Sidney and Dorothy Dillon in 1973. The Dillons, who lived in Oldwick, New Jersey, had five children who attended boarding schools and colleges in the Boston area, so the summer house at Nantucket was a convenient destination for the younger generation. The five siblings, who were given partial shares in the property by their parents, established the Rugosa Cottage Trust in 1995. The Trust sold the property to John Merson and Carol Bunevich in 2004. The erosion of the North Bluff of ‘Sconset over the last fifty years or more imperiled the house, so plans were made to move it to a safer location on the west side of the lot. In the fall of 2009, the north ell of the house was removed, as was the garage situated near Baxter Road, but the great room was relocated and enlarged following the tenets of the classic International Style. A dominant feature of the west façade of the house, the wide brick chimney was rebuilt, and a kitchen was added to the north end of the great room. Careful attention was paid to all the elements of the design, particularly the horizontal line emphasized by the red cedar clapboard, exterior fences, and interior stair rails. New rooms, like the squat bedroom tower and the basement suite of bedrooms, baths, and sitting area, create nearly the same floor space as the original house in half the footprint. East facing windows on the lower level—made possible by the creation of a sunken patio—and five skylights below grade on the west side, fill the interior with light. Architect Timothy Lindman created the new design and Ted Lambrecht supervised all the work, completing the project in the Spring of 2010. Friday Find: Found the “Friday Find”! The act is rather basic, but has shown to have a large impact and even saved endangered buildings. 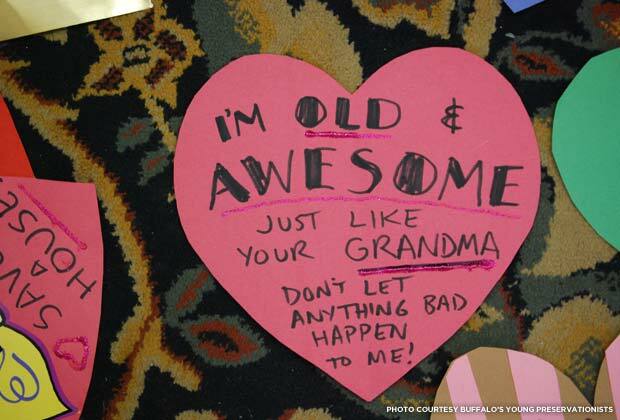 Preservationists gather together and create old-school valentines using sparkles, construction paper, scissors, markers, crayons ect. They then either place these all over an endangered building or stand in the front holding them and document with photographs. 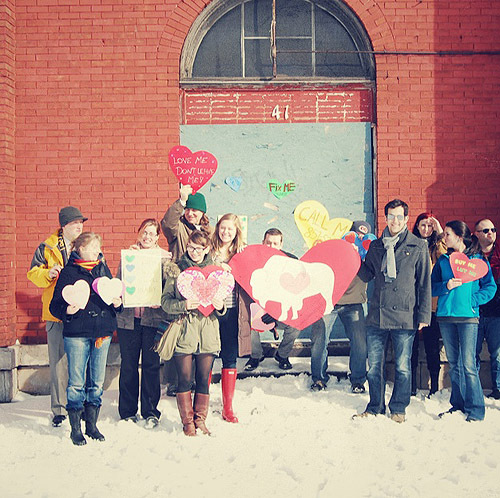 The first year Buffalo’s Young Preservationists decided to heart bomb four historic buildings, which they feared were in danger. 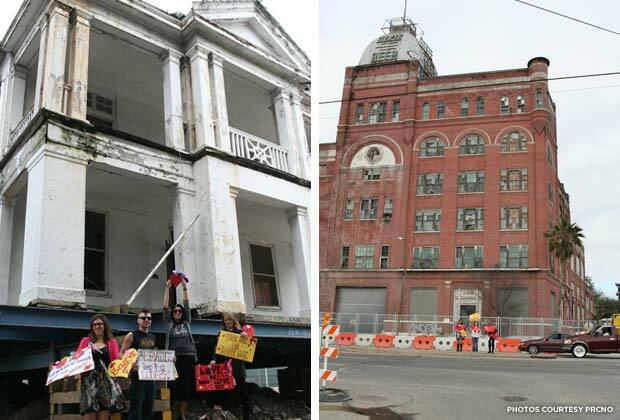 Today, the four buildings are all standing and have been saved! Today, the act is practiced across the nation and is an excellent way to highlight the need for preservation. Last year five cities participated including Cleveland OH, Buffalo NY, New Orleans, Twin Cities MN, and Vermont (digitally). 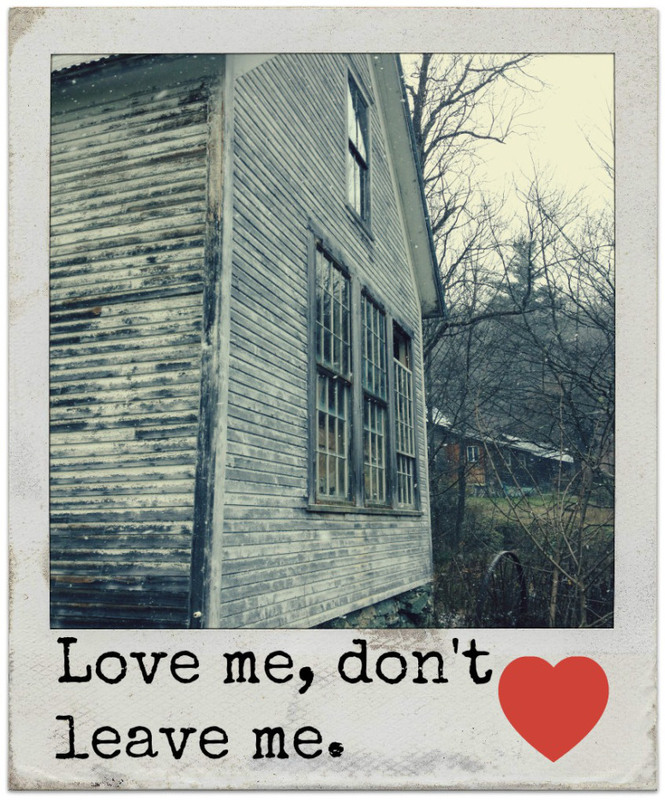 The valentines created stated messages such as: Love me don’t leave me, Invest in me, This building rocks, and This place matters. 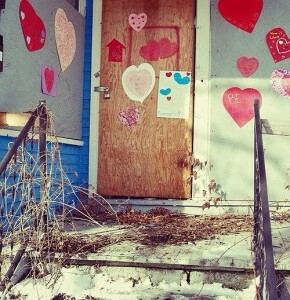 Would you like to heart bomb a certain endangered building? 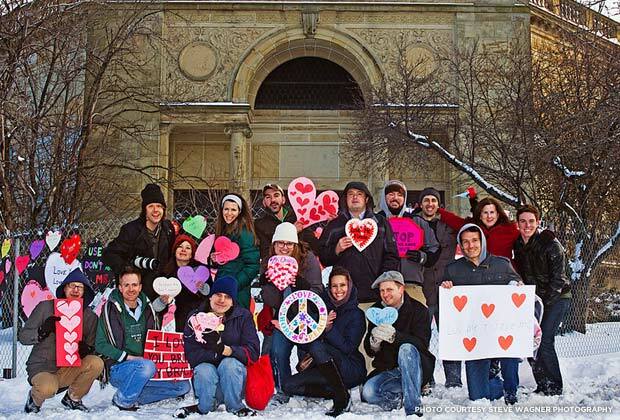 Read these two blog posts to learn where heart bombing comes from and see how other communities have spread the love. Buy your basic, elementary school art supplies. Take your Valentines and either affix them to the place, or stand in front of it holding your declarations of love. Share all those pictures (and tweets and Facebook posts and pins …) with the hashtag #iheartpreservation. Send your very best pictures to editorial@savingplaces.org by Friday, February 20. (Feel free to keep heartbombing until the end of the month, though!) Please include a one-paragraph blurb about why you love this place and why more people should fall in love with it too.